Xclusive Kukri series are Kukris designed by Khukuri House Thamel (Khukuriblades.com) only, utilizing our experience and knowledge we have gained after being in business for 14 years and with the talents of skilled craftmen coming up with new Khukris that this world has ever seen or created and drawing all knife lovers to fall in love with this knife so called "Kukris". Kukri making has become an art and to creat new Kukris like the "Kukri Apache", "Kukri I-Saw", "Mini Supreme", "Svc No 5:Ultimate" and "Khu-Ka-Bar" has been a challenge and Khukuriblades.com is proud to pull it off. 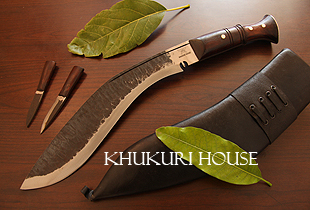 Khukuri House Thamel is working on a few more new Kukris and will launch them as soon as we make them.